Rahel Tefera is a 10 year old girl from Arbaminch, 500km south of Addis Ababa, Ethiopia. She was born with a cleft palate and has one younger sister who also was born with unilateral cleft lip and palate. In February 2012, she had her palate repaired at Yekatit 12 Hospital and received speech therapy following her surgery. Her mother did not think Rahel could cope with school because her speech was not easily understood. However, her mother was counseled about the importance of schooling. 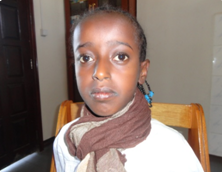 Rahel was then enrolled in school while they awaited surgery. She was in first grade when she came for surgery. Rahel reported that the students at school tease her about her speech. It was very beneficial for her that she received counseling while having speech therapy. Transforming Faces believes that no child should be left without the treatment and support of skilled and caring cleft teams, and we work diligently to make that happen.